Located on the 4th floor, the club is open for special events and rentals. JAHA regularly opens the Ethnic Social Club on the last Friday of the month at 5:00 pm, with music starting at 5:30. This casual, relaxed event is a great way to end the month. Visit our special events page for Last Friday information, as well as other JAHA events for the whole family. The Ethnic Social Club is one of several new amenities added to the Heritage Discovery Center during its 2007-2008 renovation. 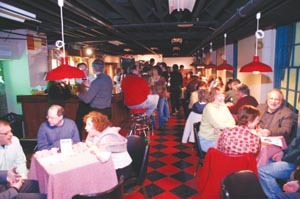 Located on the fourth floor of the building, the club’s bar, furnishings and decorations create the authentic atmosphere of a Johnstown ethnic social club. This space is used for special events that are sponsored by JAHA and by other organizations, and is available to rent for private events. The bar and backbar in the social club date from the 1940s and were designed in the Art Moderne style, and have been carefully restored. They were part of the West End Polish Citizens Club, which was originally founded to help Polish immigrants become citizens. The club was located on Fairfield Avenue before it closed in the early 1990s. Other furnishings in the club, including the tables and a blackboard, come from the Slovenian Home in Lorain Borough. 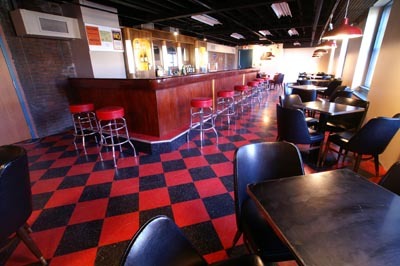 The red and black linoleum tile floor was chosen to complete the atmosphere of an authentic social club. Other decorations include a metal poster for Grossvader Old German Lager, which was once brewed in Johnstown by the Emmerling Brewing Co., and JAHA expects to add more social club memorabilia in the near future. 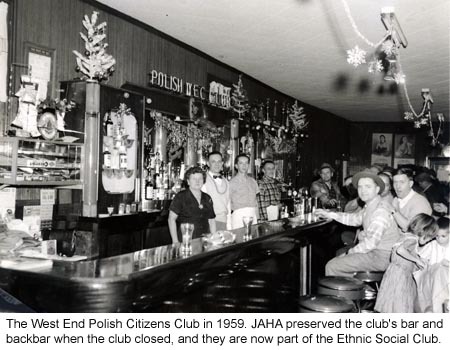 Ethnic social clubs played a major role in Johnstown’s history, and many are still active today. 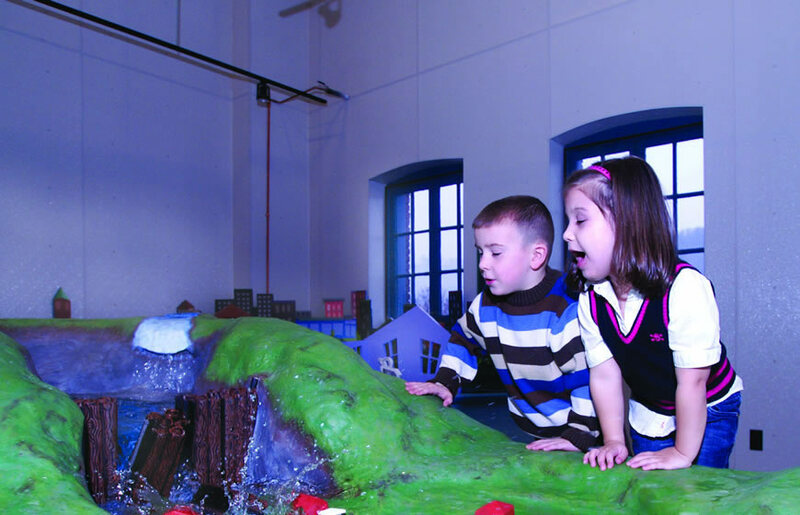 At their peak, more than 100 clubs were active in Johnstown. Initially, they were founded to help recent immigrants adjust to life in America, providing needed social and economic support, including insurance benefits, citizenship classes, English classes and more. By the end of World War II, most clubs filled a purely social function, and as the clubs’ native languages shifted into disuse many clubs began admitting members of other ethnic groups.